The mightiest Chinese dragon of all times will be your faithful companion this April as you claim up to 100 Free Spins when you deposit as little as $25! 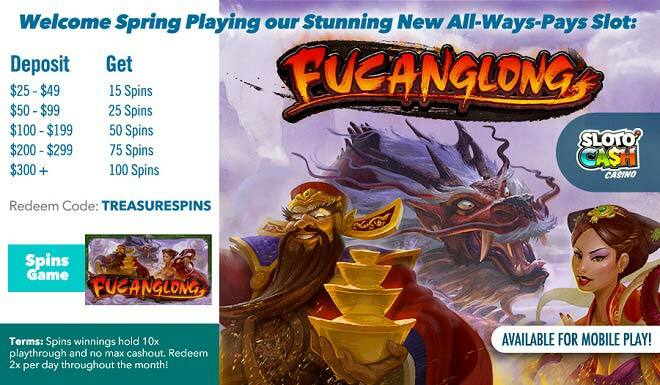 Spin the powerful reels of Fucanglong and play with the Wild Dragons that appear on reels 2, 3, 4 and 5. The Scattered Dragon Mountain symbol will trigger the free spins game feature, which can be retriggered many times. While the free game feature is active, Wild Dragons will expand to cover the reels, and prizes will be multiplied with each retriggering of the feature, up to 8 times your original bet! Time to officially welcome Spring with the power of the most mythical dragon and up to 100 Free Fucanglong Spins! Deposit $300+ Get 100 spins!